The city and TischlerBise developed five residential and four nonresidential land use prototypes for examination. The five residential prototypes included Single-family Detached, Townhome, Duplex, Multi-family Rental, and Multi-family Condominium (owner-occupied). The four nonresidential uses were Retail, Office, Industrial, and Research & Development (R&D). This analysis focused on the fiscal impact of selected land use prototypes without regard to geographic location. For this reason, the analysis used an average costing method, particularly for one-time capital costs. In some cases, the costs may be fixed. In other cases, costs are offset in whole or part by revenues from a particular service. The net fiscal impacts for the nine land use prototypes were determined by subtracting the costs necessary to serve these land uses from the revenues generated by each. The cost and revenue factors were determined based on the city’s FY2007 budget and current levels of service provided by the municipality. Capital cost factors were determined based on Dublin’s Capital Improvement Program (CIP). The analysis includes the city’s tax supported funds affected by new development. To derive the costs, revenues, and service levels, TischlerBise interviewed department staff and reviewed the current budget, along with other financial and demographic data. None of the residential land use prototypes studied produced a net surplus to the city. Income taxes and property taxes comprise approximately 70 percent of all revenue collected by the city for residential development. However, the revenue collected by these two taxes, as well as other tax supported funds, were not sufficient to cover the costs of providing services for any residential prototype. The number of persons per household and vehicle trips per household were the main reasons for differences in the expenditures. The higher the number of persons per household and vehicle trips, the greater the costs. The single-family detached prototype produced the greatest revenues, averaging $991 per unit. It also generated the greatest expenditures, averaging $2,703 per unit. The annual net deficits for the single-family prototype were 71 percent higher than multi-family condominiums, the residential prototype that had the second highest annual deficit. The higher costs are due to the number of persons per household, as well as a higher trip generation rate. The primary difference in revenue between remaining residential prototypes (excluding single-family detached) was the market value of the home. For example, there was a $68 difference in total average revenue between townhome and duplex units. Of this difference, $48 could be explained by the variation between the market value of the homes. 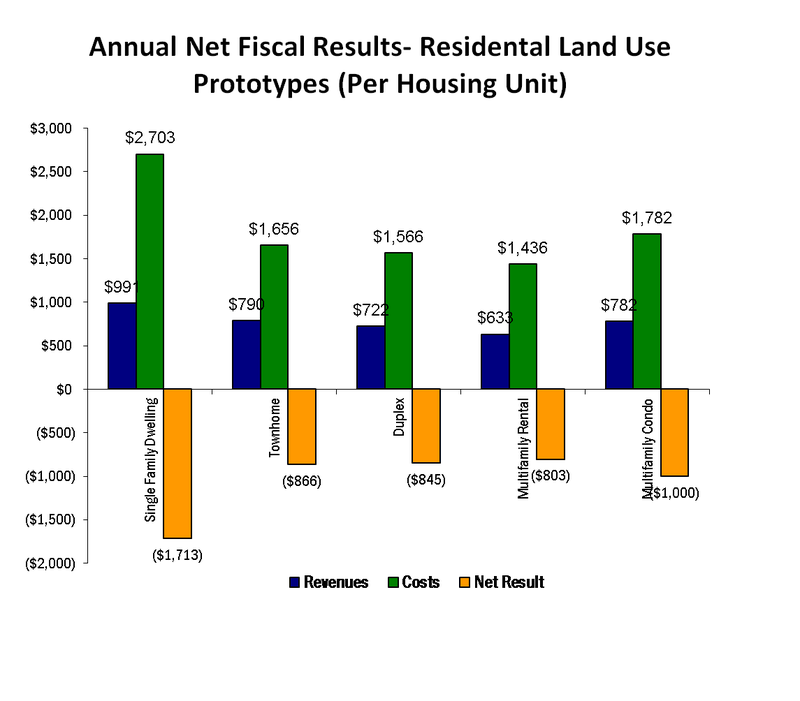 The fiscal impact results for the nonresidential land use prototypes are summarized below. It is important to note that the assumptions reflect current (2007) levels of service. 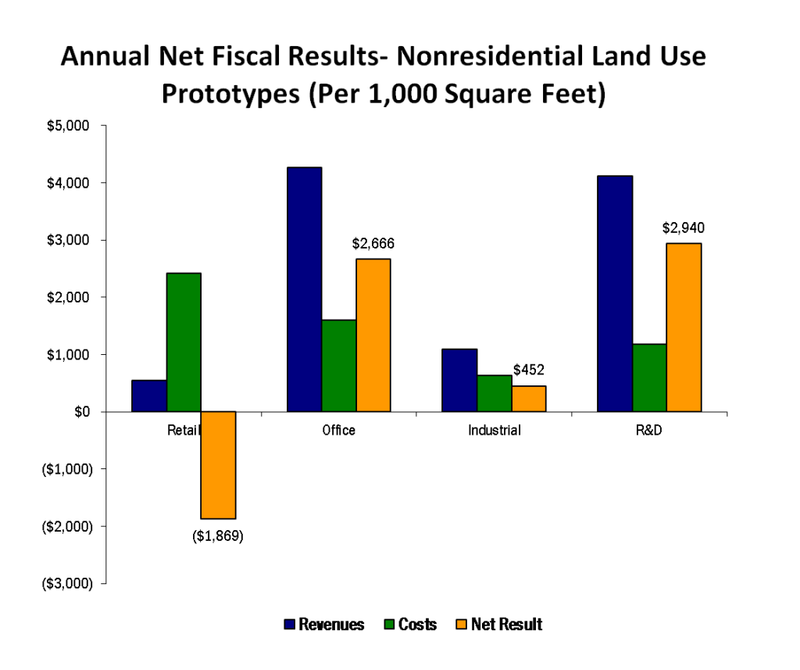 Three of the four nonresidential land use prototypes produced annual net surpluses, with only the retail prototype producing an annual net deficit. The retail prototype produced a net deficit because the income taxes generated were the lowest of the four prototypes and police costs were the highest (about 2.5 times more than the next highest prototype, which was office). Lower income tax was generated due to the lower wages of service employment. The office and R&D prototypes had net surpluses primarily due to the income taxes paid, which was an average of $1,328 per employee. The retail prototype had net deficits because this was the lowest income tax paying prototype, averaging $123 per employee or $324 per 1,000 square feet. The income tax generated from this prototype was not sufficient to cover the major operating expense of police services and road capital improvements, totaling $1,606 per 1,000 square feet. Another reason the retail prototype had such a large deficit was that the capital expenditures for roads are $900 per 1,000 square feet compared to $370 per 1,000 square feet for office, the next highest prototype. The costs were larger due to higher trip rates. The vehicle trips for the retail prototype were 67 per 1,000 square feet compared to 18 per 1,000 square feet for office, a difference of 370 percent. The research and development (R&D) prototype generated the highest net surplus of all nonresidential prototypes. This was to due to the second lowest costs for police and capital improvement costs for roads, as well as higher income taxes. Ohio’s local government revenue structure is unique in that the primary revenue source is income tax. Since income tax is collected first in the City of employment, residential development generally does not pay for itself. Therefore, it will be necessary for the city to attract new jobs, especially office and R&D, to cover the costs of residential growth. The single-family detached prototype generates the worst fiscal results for the city. This land use consumes a large amount of the city’s services because of the high number of persons per household and vehicle trips. It is likely that actual costs to serve the residential and nonresidential land uses are greater than the costs determined in this analysis. As discussed above, there is a limitation of the average cost approach utilized in this type of evaluation. For example, as is the case in most cities across the country, the capital improvement plan and general operating budgets are fiscally constrained. That is, they do not fund the actual demand for services. Rather, they fund a level of service that can be afforded by the community. In addition, the cost to serve new development in the future is likely to be greater than the average cost of service today, even in constant dollars. As stated above, it is important to acknowledge that fiscal issues are only one concern when evaluating land use policies and decisions. Non-fiscal issues such as the environment, housing affordability, jobs/housing balance and quality of life must be considered. The emphasis should be on achieving an appropriate mix of land uses.